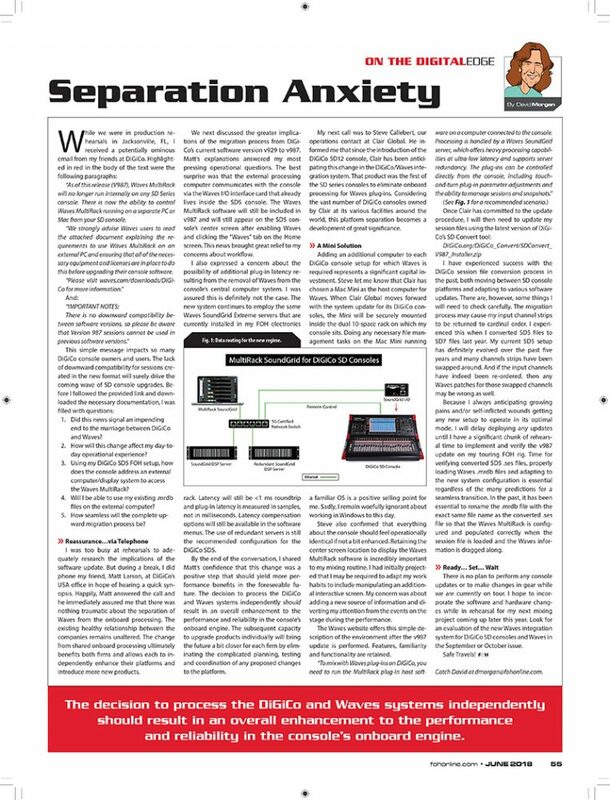 In the text of last month’s column (FRONT of HOUSE, June 2018, page 55), I discussed the imminent separation of shared internal processing platforms between the DiGiCo SD console operating system and Waves MultiRack plug-in software. At first, I expressed some reasonable trepidation about this transition. But as I proceeded further in the process of understanding, I developed a strong professional enthusiasm for the upcoming changes. At this point in time, if one chooses to include Waves in the console setup, procuring an independent processing system is already mandatory for customers who purchase a new DiGiCo S Series, SD12 and the soon to be shipping SD7 with the Quantum engine console. Furthermore, when current owners choose to upgrade their SD series consoles to DiGiCo’s version 987 software, the switch to independent processing systems is also required. I will be enacting this hardware change for my next tour. In May, when DiGiCo announced this platform-changing update, some terms in the descriptive material influenced me to form erroneous conclusions and flawed judgments that I then published in this column last month. I apologize for any inaccuracy in reporting and for depending on a muddled recollection from a reassuring, but still rushed, telephone conversation. Because I have experienced so much success with the current DiGiCo/Waves arrangement, I obviously wanted to believe that any changes resulting from the DiGiCo 987 update would be minimal. My initial misinterpretation of these two simple statements in particular started me down a road to greater misunderstanding. While both quoted statements are technically true, I believed these quotes implied that there would be far more retained console-based touch screen control over Waves plug-ins than will now be the case once the two processing platforms are separated. And as these announcements concerning the new DiGiCo paradigm-defining Version 987 software update seemed a bit ambiguous, I was motivated to pursue further research into employing the new software arrangement. I began to question the initial conclusions drawn from the DiGiCo and Waves information releases I had first read. Determining the actual repercussions from the conditions of the new relationship definitely required further questions, verification and elucidation. It became apparent that I needed to build a better understanding of the extent to which these software and hardware changes will affect end-users like me in the day-to-day operation of our SD consoles. I had no problem admitting that my initial interpretation of the informational material was flawed. In search of a greater clarity, I reached out to representatives from both companies to discuss the real-world operational changes to the SD console/Waves interaction in deeper detail. Both Matt Larson from DiGiCo and Noam Raz from Waves were happy to help. DiGiCo’s Matt Larson was onsite with me at our show at Xcel Center in St. Paul. He explained that as DiGiCo and Waves developed new features into the console, they decided that pulling the Waves processing (MultiRack control) out of the DiGiCo internal platform along with the addition of OSC (Open Sound Control) would allow an even greater interface platform with additional horsepower for adding new features over time. The evolution of the DiGiCo v987 software update ultimately progressed to a point at which removing the internal Waves MultiRack and display touch control in the DiGiCo console to an external computer with an additional monitor (with or without) Touch Control became the wave of the future. As I previously stated, I very much support the concept of altering the interaction between the two platforms if the result is new or improved products from each company becoming available to the mixing community sooner. Eliminating the burden of cooperative development processes will allow each company to update products at its own pace and in its own way. In other words, when Waves releases an update, it will be available to the DiGiCo platform that same day instead of having then be integrated and tested again. I first asked Matt to guide me through the process that will be required to network a new outboard computer to the SD5. As Clair Global had previously expressed, Matt recommended deploying a compact dedicated processing unit (such as the Mac Mini) to run the Waves MultiRack software. Matt further recommended running the MultiRack in a Windows environment on the new Waves host computer if you are using a monitor with Touch Control. If a Mac is your preference, you can run Bootcamp to have a Windows system. Networking the added processing device will be as easy as plugging an additional cable into the 6-way Ethernet switch that now lives in the doghouse behind my SD5 linking the SD console and the two Waves Extreme Servers. We normally carry two Extreme Servers so I have redundancy. The new DiGiCo operating system does retain specific software features that still link some console functions with the Waves MultiRack running on the external host computer. The Waves I/O card will remain in the SD console. This means that the current onboard system for patching outputs, inputs and insert points to elements placed in the Waves MultiRack will remain unchanged. Retaining this operational relationship keeps archived Waves .mrdb files and archived DiGiCo .ses files from becoming obsolete. You can just load any older session and it will update to the v987. If you need to change your session from one model to another, you can download the DiGiCo SD Converter; this conversion software will convert your session from say, a SD10 to a SD5 file. Matt and Noam each were able to steer my thinking back in the right direction regarding screen control for Waves plug-ins. My initial conclusion (or maybe it was just a desperate hope) that control on the center screen of my SD5 console would be retained turned out to be erroneous. When I read that the solo interaction that calls the elements of an individual Waves plug-in rack to a display when a specific input or output is put in “Solo” had been retained, my assumption was that the screen location would also be retained. Noam Raz from Waves pointed out the error in that deduction: the MultiRack will appear on the external Waves host computer screen, not inside the console’s screen. One of my concerns with the update was the extent to which my normal work habits would be altered. I have always tried to watch the action on the stage attentively while mixing the show. Within the present operating system, manipulating Waves plug-ins on the SD5’s center screen only requires that I briefly divert my eyes in a downward direction. However, I remain facing the stage, and redirecting my concentration to the on the musicians once a task is complete is instantaneous. Growing accustomed to the new computer dictated by the new operating systems will require a period of adaptation and experimentation. Luckily, there will be a prolonged rehearsal period before my next project hits the road. I will need to consider different touch screen sizes and/or shapes and then determine the optimal placement of the screen. My goal will be to facilitate the most natural work routine. Being right-handed, I will mount the added touch screen to my right. I’ll publish a photo when I have found the right spot for the Waves display. It will also take a bit of time to discover which plug-in functions will be controlled by the SD5 console’s Touch-Turn section. I am also curious to determine how often I will need to interrupt console workflow to address a separate keyboard and mouse or track pad. I will also need to locate a convenient surface for those elements that does not inhibit the free movement of my hands and arms while mixing. I will soon begin to research which add-on arms may be best for use with DiGiCo products. For the past 13 years, my experience with digital consoles has been mostly the Digidesign/Avid VENUE platform or the DiGiCo/Waves partnership platform. I freely admit that I have been totally spoiled by the simplicity of operation, the ease of navigation and the vast availability of tools in a complete mixing environment delivered by both these platforms. I am sure my personal reservations concerning the changes to the DiGiCo/Waves interface will quickly disappear once I get everything up and running in system 987.On my current tour, I have experienced great success while mixing the show “straight ahead” — without using any snapshots. In sharp contrast, I believe that the project I will join in August will require that I build multiple, detailed snapshots for each song as well as some snaps within individual songs. I am grateful that the ability to include Waves plug-ins in those snapshots has been retained in the 987 software update. This agility will greatly influence my decisions in populating the Waves rack with effects devices designated for snapshot recall. More reports to come!